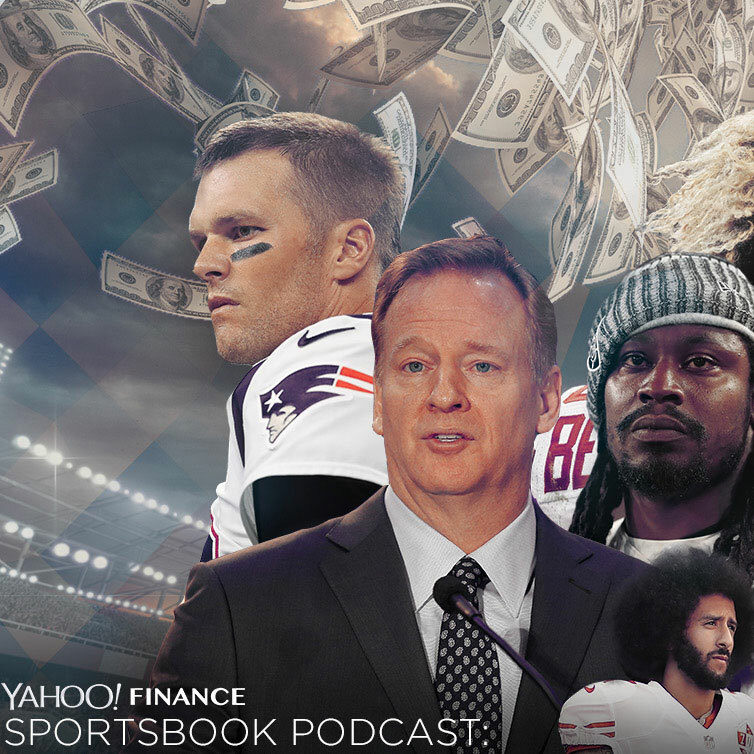 Sportsbook is our weekly sports business podcast. Yahoo Finance’s Daniel Roberts brings you to the intersection of sports and money through interviews with athletes, commissioners, founders, and CEOs. This page houses all video interviews and stories that come out of the Sportsbook podcast. Rudy Cline-Thomas, a venture capitalist and NBA star Andre Iguodala's investment partner, says some athletes will go broke over tech. A new 450-page book, "Belichick: The Making of the Greatest Football Coach of All Time," sheds light on the New England Patriots coach — a man sports fans know very little about. Michael Lombardi, author of a new book on NFL leadership, shares lessons learned from working with teams like the Patriots and Raiders. The biggest star in pro lacrosse is leaving Major League Lacrosse to launch his own rival league, with Wall Street backing. Dale Earnhardt Jr. speaks candidly on concussions in auto racing and on how he used endorsements to build his own brand. Golf legend Greg Norman talks Tiger Woods, America's Ryder Cup defeat, and how golf can attract more young people. NFL veteran Martellus Bennett says the NFL was always just a distraction from his true passion: animation. A new book recounts the fascinating history of the USFL, and the role President Trump played in its downfall. Companies nervous about getting pulled into the increasingly political NFL conversation should take a stand one way or the other, one ad executive says. Otherwise, they risk becoming irrelevant. DAZN, the U.K. sports streaming platform, is launching in the U.S. in September with exclusive boxing and MMA fights and aims to be a Netflix for live sports. MLB has an attendance problem, and is looking to collectibles for help. The owner of Bergino Baseball Clubhouse in NYC says collectibles are independent from the current problems in baseball today. Major League Baseball is launching MLB Crypto Baseball, a game where users will pay in ether to buy digital collectibles tied to specific moments in games. Why a Japanese fast-fashion retailer is paying up to endorse the 36-year-old Swiss tennis star. Disney is close to buying most of Fox's assets, but won't get to keep the regional sports networks. The return of Tiger Woods is reenergizing pro golf—even his fellow pros know it. The Travelers Championship looked dead in 2006 — these days it's been completely revitalized, and players and fans say they love it. Sports video app Fancred jumps into the live broadcast space for the NBA Finals with comedian Michael Rapaport and NBA alum Brian Scalabrine. Swedish soccer star Zlatan Ibrahimovic, new to the LA Galaxy, will be the face of Visa's global marketing campaign for the World Cup. Is he the right choice? Super Bowl champion Martellus Bennett talks Trump and kneeling protests, NFL ratings decline, retiring from football, and his children's books and business plans. Super Bowl champion Martellus Bennett, newly retired from the NFL, is focusing on his creative firm The Imagination Agency, and looking to Apple, Disney, and Nike for business lessons. NBA Hall of Famer David Robinson, member of a newly formed Commission on College Basketball, discusses the ongoing NCAA corruption investigation and its impact on March Madness this year. MLB extends its deal with YouTube TV, including sponsorship of the 2018 and 2019 World Series, and bringing MLB.tv to YouTube TV subscribers for an extra fee. Golden State Warriors star Draymond Green is buying 20 Blink Fitness gyms. As his Warriors teammates jump into tech investing, Green is focusing on fitness businesses. The ongoing FBI probe into bribery at top college basketball programs is moving slowly, but Yahoo Sports’ Pete Thamel says it could be a “tipping point” for exposing corruption in the sport.